Since I am a Japanese person living outside of Japan, it's sort of amusing to see how my home culture has become so trendy in recent years. Japanese food along with other Asian cuisines have been incorporated into the lineups of mainstream European and American food sources. You no longer have to explain to people that ramen is a kind of (mostly sold as instant) noodle, or that tofu is not a sort of cheese. At Migros, the leading supermarket chain in Switzerland, they sell even an odd-tasting drink they call Kombu-cha (kombu seaweed tea) which is nothing like any kombu tea I've ever encountered in Japan, but it's just one indication of how popular Japanese-like flavors are becoming. Traditional Japanese snack foods like senbei (rice crackers) and dried bean and pea based snacks are quite "in" at the moment too. Since most such snacks are air-dried instead of being deep fried, they are a bit healthier than things like potato chips. At the moment the snack getting the most attention may be the stingingly strong wasabi pea snack, a rather recent innovation (as in, the last 10-15 years). There is another old time Japanese snack which I think has all the star potential to become trendy: kakipea. Kakipea is a mixture of two items. The first is the kaki part, which is a shortened form of kaki no tane, which literally means persimmon (kaki) seeds. They are not real seeds, but rather tiny little puffy rice crackers that are shaped to look sort of like seeds. The little "seeds" are coated with a mixture of soy sauce, various typically Japanese flavorings like sugar, bonito flake flavor, and so on, and most importantly chili. The chili makes them quite spicy, though not with the tear-inducing, nasal-clearing strength of wasabi peas. Wasabi flavored kakipea are also available, but I prefer the original soy sauce-based ones. 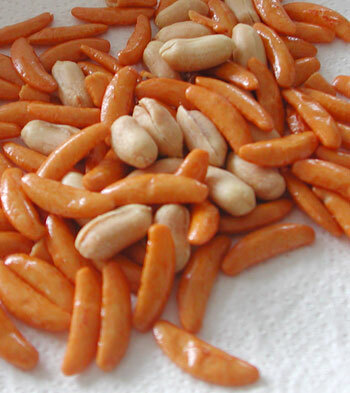 Tempering the spiciness of the kaki no tane are some plain roasted peanuts - the "pea" part of the name. (Well in correct romaji the a would be an e, but kakipee doesn't sound too appetizing.) The balance between bland nutty peanut and spicy kaki no tane is the key to the more-ishness of kakipea. 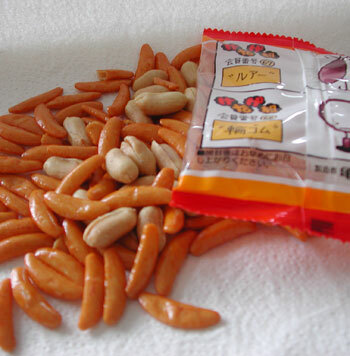 Although kaki no tane is sold on its own, I think it achieves true snack-star status by its pairing with the peanuts. Incidentally, most packages that are called kaki no tane nowadays are actually kakipea. The kind I like is made by Kameda Seika. They sell kakipea in convenient bags of 6 minipacks. Each minipack is about 200 calories. The mix of carbohydrate, protein and fat in each pack is just perfect as a mid-afternoon snack, and the spiciness wakes you up nicely. Nothing is deep-fried, so no greasy hands. A bonus of the Kameda minipacks is that each packet is illustrated with the most adorable characters, the kenage gumi - those objects that never assume a starring role and just keep plugging along. Some kenage zoku on recently consumed packs include the back of a postage stamp, weather vanes, and the shells that get used as temporary dishes for shellfish dishes and then get discarded. I think the message is that kakipea are unsung hard workers of the snack world, or something. It's a very Japanese sensibility. If you don't read Japanese, just enjoy the cuteness of the illustrations as you crunch away. For a preview of the cute illustrations, check out the Kameda Seika website (Japanese). Kameda brand snacks are available at most Japanese and Korean grocery stores, and also from online sources. The drink to have with kakipea, is green tea, hot or cold. They're also excellent beer snacks. Submitted by maki on 2006-03-06 20:03. Wow! I've just tasted Kaki n Tane! It's amazing! I Loved it! and since I got them as a present from a very nice japanese gentleman (friend of my father-in-law), the packaging is all in Japanese... I've been wanting to know what they're made of, and I found this site! You've been a lot of help! You have no idea how much I love these. I grew up in Communist Bulgaria and would buy kaki no tane from an old man who sold popcorn and other snacks outside a movie theatre in downtown Sofia. The "rice nuts" as we called them in Bulgarian were relatively cheap and I would eat them by the kilo. Then, after communism fell, the rice nuts disappeared. Luckily, I now live in America. This time I eat the rice nuts by the pound. Boy, I sure miss those kakipeas! They were great snacks when I lived in japan. It is hard to find them in the States, but I think they are catching on. My favorite were the Wasabi flavored ones by Kameda. One more reason to go back. Mmmmm my mom just sent these to us. We ate them all in like, 30 minutes. I have not seen kakipeas in any Pottstown store yet, but I can get the kaki no tane from a brand called Hapi. They are absolutely D'lish. I do like those other rice crackers too. The "kombucha" threw me when I first saw it, too...but I got to see the genesis of it. It's not kombu no ocha at all. It's some sort of strange fungus based drink - "kombucha" (pronounced come BOO cha). Fizzy and slightly sour and sweet. Weird. I think it got popularized by the macrobiotic gang. Thank you so much for telling us about this tasty treat! A friend sent my aunt some of this, but neither of us could read what it was. It was so tasty, though! I recently found some in an Asian import store, but once again could not read the packaging. Last month I travelled Japan. and Kakipea is my favouried snack from Japan. Just a few days ago I order plain Kaki no Tane. I need to go to the suspermarkt tomrrow and buy some peanuts to add. is there a ratio how to mix them? Have anyone any idea how I can order this snack in Belgium? where to do you buy this in the PH?